Chateau Leoville Barton 1997 2nd Growth, St Julien. Lovely violet and berry aromas, with hints of minerals. Medium- to full-bodied, with velvety tannins and a medium-sweet fruit finish. Chateau Leoville Barton 1997 2nd Growth, St Julien. 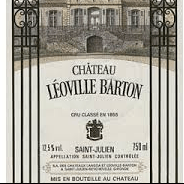 The elegant, spice box, cedary, oaky, red and black currant-scented and flavored 1997 Leoville Barton reveals surprising softness, medium body, low acidity, and ripe tannin. Drink it over the next decade. I would not be surprised to see it improve in the bottle, and possibly merit a higher score. Tasted twice. Soft rounded berry nose. Quite pretty and Margaux in style. Fine sweet tannins. Notes of cherry, toffee and strawberry. Light but elegant with good acidity. Very pretty wine. he 50 hectares of Léoville and 17 hectares of Langoa, planted in gravelly soil with a clay sub-soil, include large proportions of old vines in order to obtain the best possible quality. The grape varieties is 74% Cabernet Sauvignon, 23% Merlot and 3% Cabernet Franc for Léoville Barton, while Langoa Barton’s terroir is shared as follows 57% Cabernet Sauvignon, 34% Merlot and 9% Cabernet Franc. Both properties have the same vinification methods.